Some notable milestones to pass on the way to 100% renewable energy are one-quarter, one-half, and three-quarters renewable electricity generation. The average CO2 emissions per kilowatt-hour for all electricity generated at each of these milestones might be 660 grams, 440 grams and 220 grams respectively. But they could be much less. At this milestone, one-half of all electricity is delivered from renewable energy sources with no fossil-fuel CO2 emissions - solar PV and solar thermal, wind farms, hydroelectric including pumped hydroelectric storage, and battery storage. 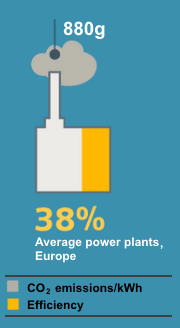 The other half of electricity is delivered from fossil fuel power generators. These power plants are only dispatched at times when total demand exceeds the total capacity of all the available renewable energy sources. These fossil fuel power plants may have average CO2 emissions per kilowatt-hour of electricity of 880 grams. In this case the average CO2 emissions per kilowatt-hour for all electricity generated at the halfway milestone will be 440 grams: (Zero for the half from renewable energy sources plus 880 grams for the half from fossil fuel power plants) divided by two. It isn't necessary for the CO2 emissions from the electricity generated by fossil fuels to be nearly this high. They can be reduced to three-eighths of 880 grams per kilowatt-hour of electricity. A way of doing this allows the use of power plants that are far more efficient than coal-fired power plants, are far cheaper to build, and are able to start more quickly in response to increases in demand. A further advantage is that they use only three-eighths of the coal to generate each kilowatt-hour of electricity so the cost of mining and transporting coal for electricity generation is cut to just three-eighths of the cost with the less efficient, more expensive coal-fired power plants. This way of supplying electricity at the halfway milestone reduces the average CO2 emissions for all electricity generated to just 165 grams: (Zero for the half from renewable energy sources plus 330 grams for the half from fossil fuel power plants) divided by two. The reduced quantity of coal for fuel for the combined cycle power plants can converted to methane by a reaction with hydrogen. The hydrogen can be produced by electrolysis using excess renewable energy generated whenever total demand is less than the output of renewable energy sources. A coal-fired power plant that is emitting 880 grams of CO2 per kilowatt-hour burns coal containing 240 grams of carbon for one kilowatt-hour of electricity. Coal containing just 90 grams of carbon (three-eighths of 240 grams) is all that's needed for a combined cycle power plant to generate a kilowatt-hour of electricity. The objective in manufacturing supplemental pipeline gas is to produce high- heating-value gas that is completely interchangeable with natural gas - essentially methane. The basic problem in making methane from coal is to raise the H2/C ratio. A typical bituminous coal may contain 75% carbon and 5% hydrogen, a H2/C mole ratio of 0.4:1; the same ratio for methane is 2:1. To achieve this ratio it is necessary to either add hydrogen or reject carbon. The most efficient way is to add hydrogen. The hydrogen in the coal can supply about 25-30% of the required hydrogen, but the bulk must come by the decomposition of water, the only economical source of the huge quantities needed for supplemental gas. The Sunfire steam electrolysis system, based on solid oxide cell (SOC) technology, promises lower onsite hydrogen production costs compared to legacy technologies. The ability to supply steam directly to the electrolysis module is unique and maximises efficiency. A Japanese study released in October 2017 warns of costly European policy mistakes when investment in renewable energy is increasing. 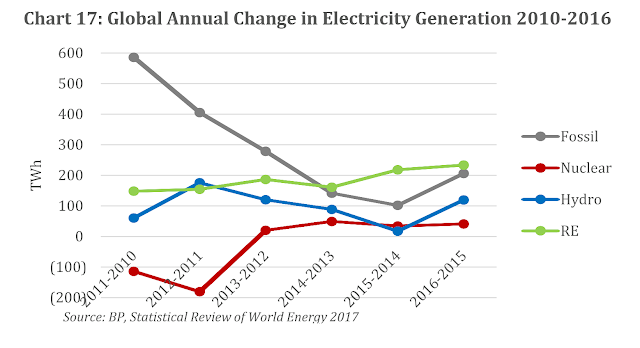 Though details of the National Energy Guarantee policy are still under discussion, the Japanese study is worth checking so that Australia doesn't fall into any of the pitfalls it warns of. This is an extract with some of the warnings in the Japanese study. Renewable Energy Institute, The Ways Forward for Japan EPCOs in the New Energy Paradigm (Tokyo: REI, 2017), 76 pp. Japan electric power companies(EPCOs) have essentially been focusing on their domestic market so far. Yet, business opportunities also exist overseas. 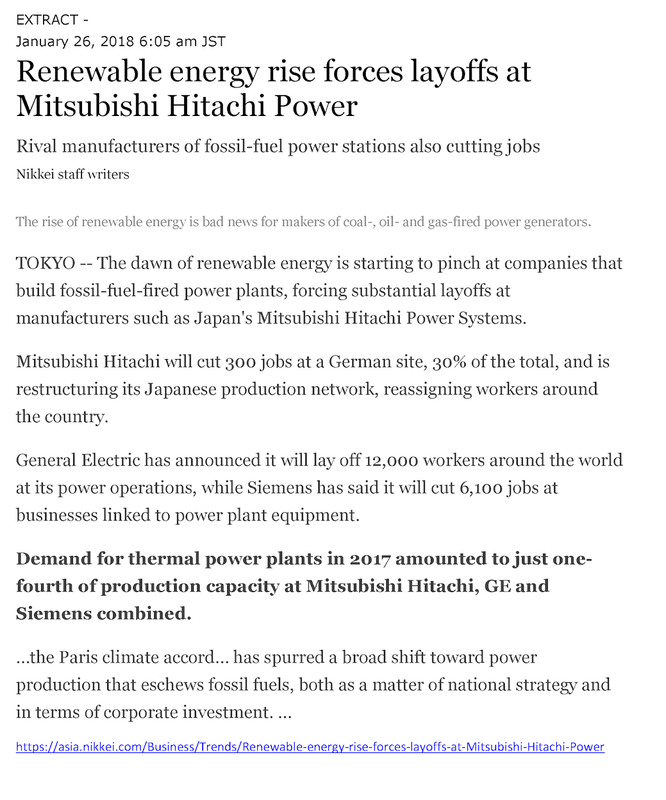 ... Critical to successful internationalization of Japan EPCOs business will be their ability to deploy cost efficient Renewable Energy (RE). To make their way through this new energy paradigm, Japan EPCOs have the chance to learn critical lessons from their European peers. European EPCOs have already faced similar challenges to those Japan EPCOs are now confronted with. And European EPCOs have failed to adapt quickly. Japan is lagging behind, and that is not necessarily a bad thing. Indeed, it means that Japan EPCOs may benefit from their European peers painful experiences. 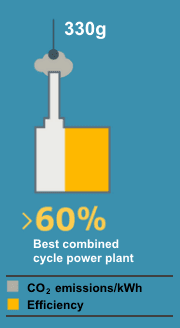 Solar PV systems can reduce electricity bills for many families and businesses. Unfortunately this isn't the case for families who rent because properties available for rent rarely have solar panels installed. Even for families who do have solar PV systems, the savings aren't that great when everyone is at work or school during the the day when the sun is shining and the solar energy output is mostly being fed into the grid. There is another way to supply solar energy to these households and help them cut their electricity bills. Many businesses are saving on their power bills by installing solar panels, but the savings would be greater if they had batteries to provide power early in the day and late in the afternoon when the output of the solar system is below the midday peak output. The worker drives the electric vehicle to work each morning and plugs it into a power exchange socket where it provides electricity to the business whenever electricity use is greater than the output of the solar PV system AND has its battery recharged whenever there is excess solar energy being produced. The worker drives the car home each day after work and plugs it into a power exchange socket where it powers the home - with solar energy stored during the day while at work - during the evening peak period when electricity prices are at their greatest. By late evening or early morning, if the car battery charge has fallen below the level that is needed for the morning peak period to prepare breakfast and for the commute to work, some additional energy from the grid is stored in the battery - again at off-peak rates. ...and so on, each day. This may make electric vehicles a better investment than just assessing their value as a replacement for a simple petrol-fueled vehicle. They can provide electricity as backup generators for businesses when solar energy output is less than the amount of electricity used and they can let workers take solar energy home. This is especially valuable for anyone who lives in rented accommodation and/or lives in one of the many households where all the members are away from the home during daytime. The following video uploaded in 2013 describes the process in 2 minutes. At that time, the Nissan Leaf had only a 24 kilowatt-hour battery. The recently released model has a 40 kilowatt-hour battery. Electric car owners will be paid for letting an energy company use their vehicle’s battery in a pioneering scheme to increase take-up of the cleaner vehicles and help power grids manage the growth in green energy. Nissan and one of the UK’s biggest challenger energy suppliers, Ovo, will offer the “vehicle-to-grid” service to buyers of the Japanese carmaker’s new Leaf from next year. After installing a special charger in a customer’s home, the supplier will take over the management of the car’s battery, with owners able to set a minimum amount of charge they want for driving the next day. Ovo will then automatically trade electricity from the battery, topping it up during off-peak periods when power costs about 4p per kilowatt hour (kWh), and selling it at peak times for about four times as much. In September 2017 Steven Ciobo, the Australian Minister for Trade, Tourism and Investment made a decision to allow taxpayer funding of coal projects. After this decision became known he was asked on 6 June 2018 to give reasons for it. The reasons reveal the loss of capacity of the Coalition Government to obtain economic intelligence needed for policy decisions. Steven Ciobo mistakenly believed (his answer to the question is shown in full below) that decisions by a number of banks and others to not invest in thermal coal mines was a consequence of social pressure rather than economic pressure. The Australian Government today reaffirmed Australia’s strong commitment to effective global action on climate change with the ratification of both the Paris Agreement on climate change and the Doha Amendment to the Kyoto Protocol. A global goal to hold average temperature increase to well below 2°C and pursue efforts to keep warming below 1.5°C above pre-industrial levels. This "coordinated global action" has a number of economic impacts and it is these that underpin decisions by banks to reduce investment in thermal coal projects - NOT "social pressure" as Steven Ciobo mistakenly believes. 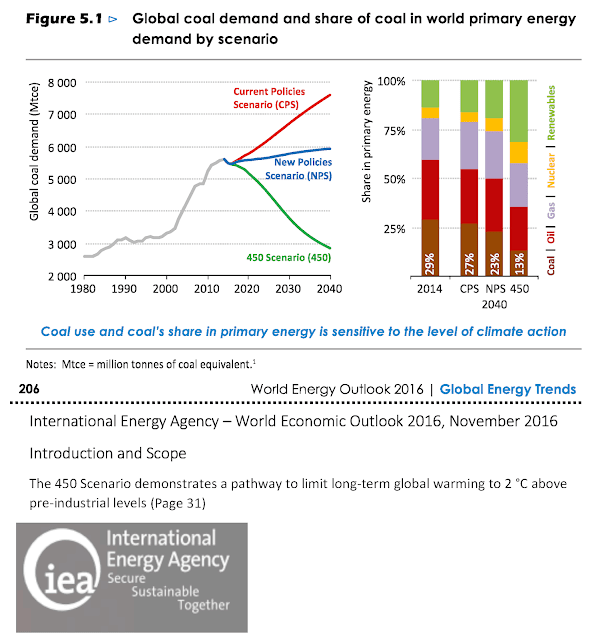 "the International Energy Association’s (IEA) modelling indicates that under a two degree scenario thermal coal demand will peak in the current decade and decline thereafter." QUESTION: Amy Remeikis from The Guardian. Just to come back home for a moment, last year you reversed the Efic decision to allow for onshore resource investment. I'm just wondering what is the rationale behind that decision given that major Australian financial institutions have been pulling away from that sort of investment since 2015, and if you didn't consult with your department, who did you get advice from, if at all? STEVEN CIOBO: Sure. Well, the rationale for it was because the decision by a number of banks and others to not invest was a consequence of social pressure rather than economic pressure. And the reason I can say that is because, contrary to The Guardian's claims and reporting, I did actually obtain advice. In fact, my decision to alter the statement of expectations for Efic went through Cabinet. And of course by definition I received advice from the department in relation to it, and they, in fact, highlighted it was a consequence of social pressure rather than economic decision-making that led to that. So that's the reason why we made the change. Because in essence it is obviously preposterous to deny viable resource projects - completely separate to the issue of coal - from securing financing for export, which creates livelihoods, drives, in many respects, rural or urban economies. I think Australia owes it to our people to do everything we can to provide and uphold their standard of living.